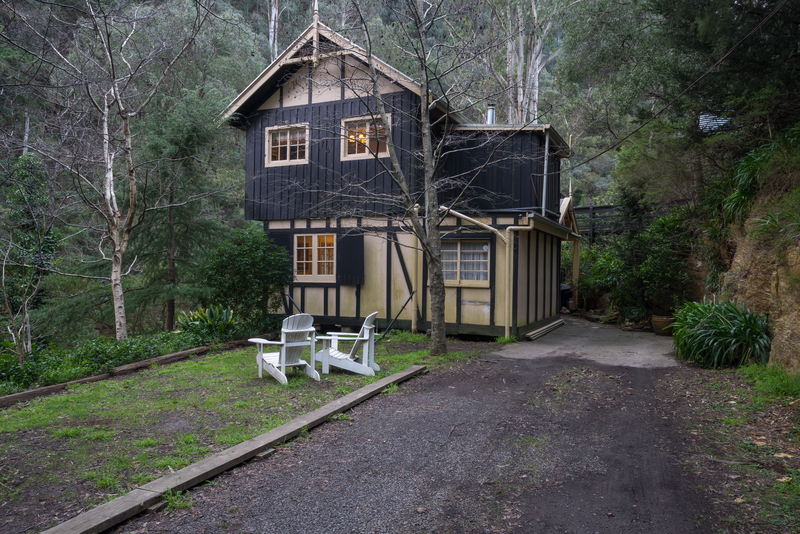 The Coach House features beautiful polished timber floors, wooden shutters and a solid wooden front door that has to be seen to be believed. 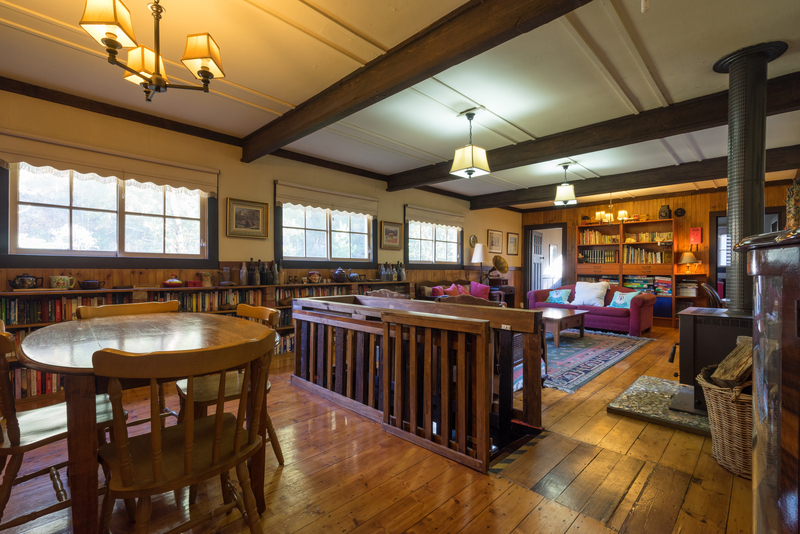 The spacious downstairs lounge/games room has a comfy couch and bunk and there are bookshelves crammed with your favourite crime writers. 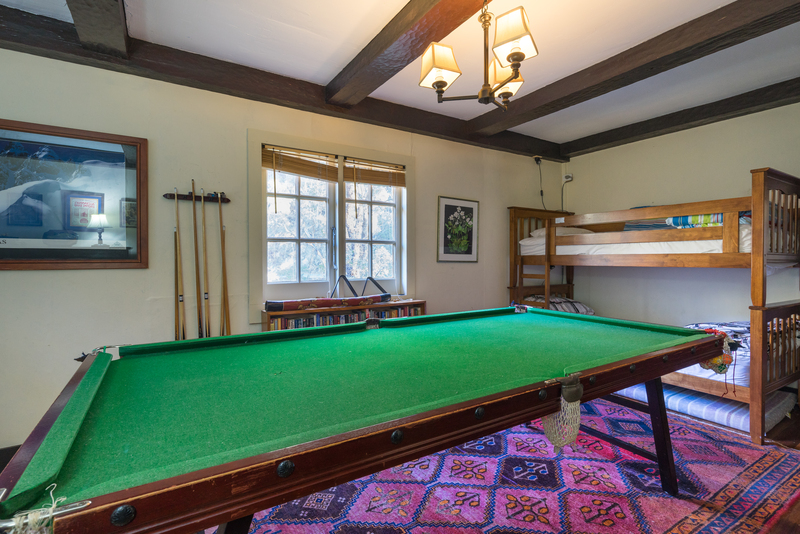 The room features a pool table and a piano which is in tune and ready to play. 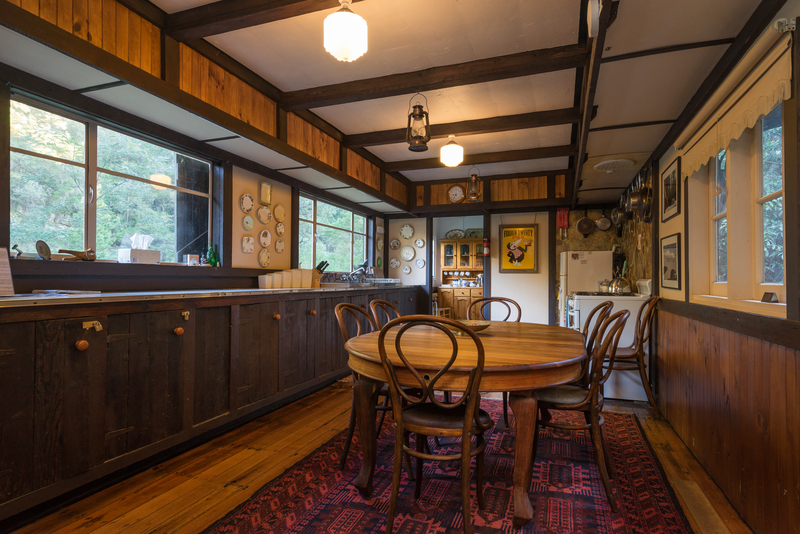 There are lovely views onto the garden and across Stringers Gorge to the tourist railway line. There is a toilet and handbasin adjacent to this room. 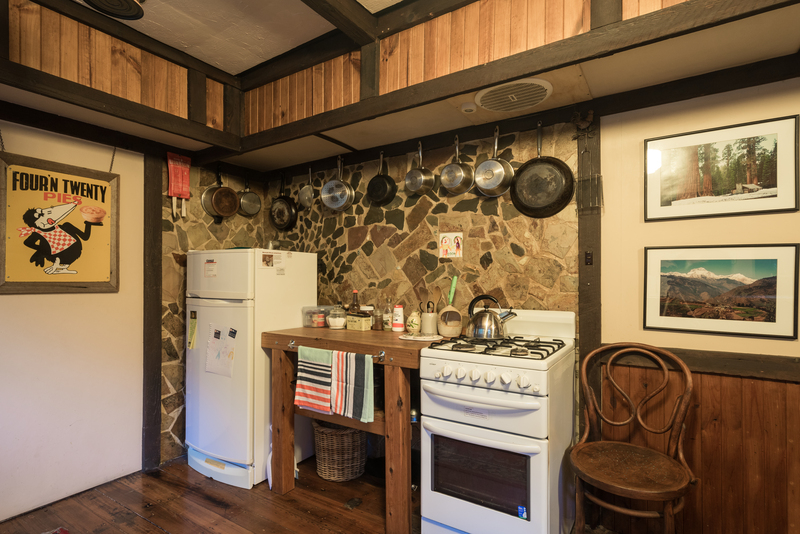 The fully equipped kitchen/dining room has views across the valley, plenty of bench and cupboard space, crockery, cutlery, glasses pots and pans, gas fridge, a gas oven/grill/cooktop and a gas heater to take the chill off in Winter. The dining table and 8 chairs provide seating for everybody. There is also an Ikea highchair available for toddlers (no tray). 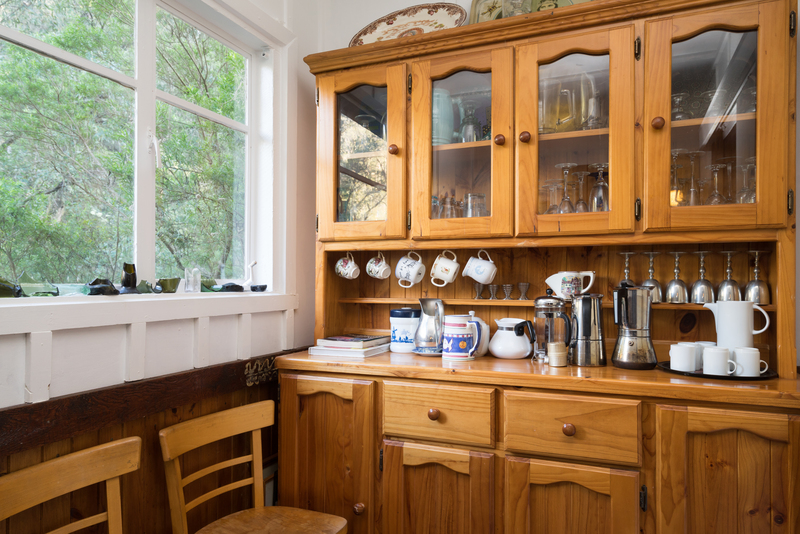 A complimentary supply of tea, coffee and sugar is provided for use on your arrival. 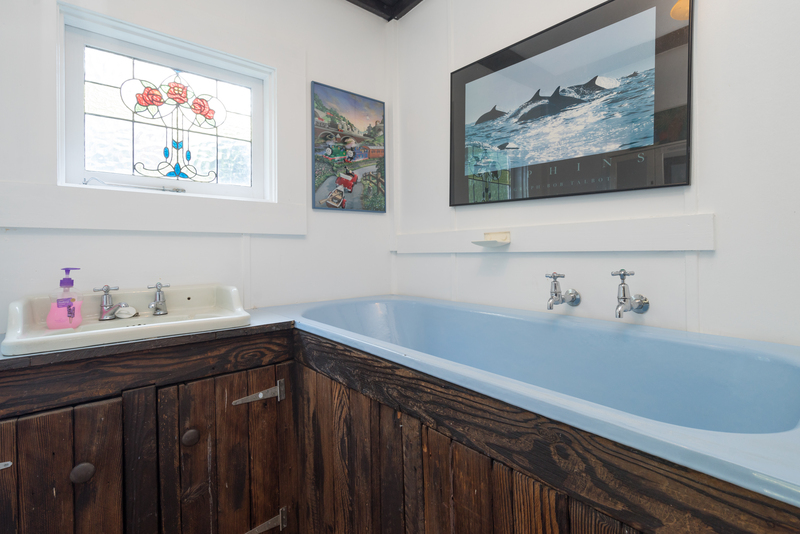 The bathroom features a lead light window and a deep bath, perfect for kids or for adults to luxuriate in and enjoy that long soak. 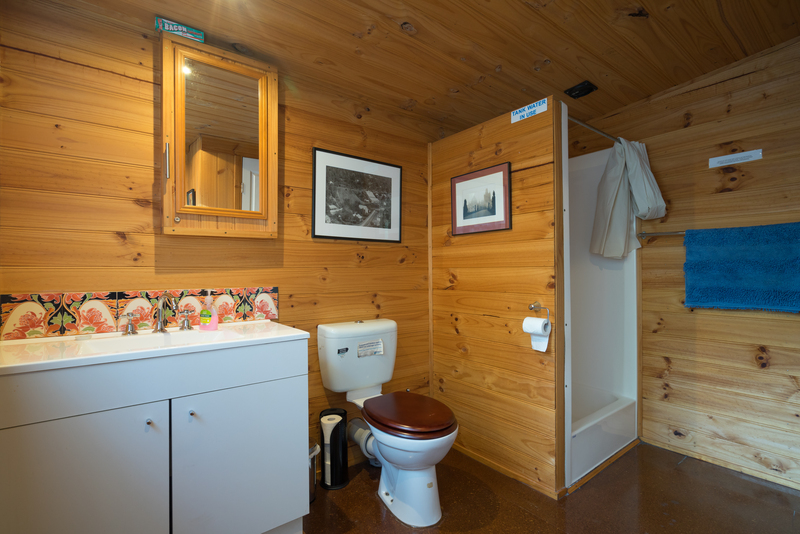 There is a separate shower in the bathroom, and a separate toilet off the downstairs lounge room for your convenience. There is an upstairs bathroom featuring a toilet, basin and a shower with a deep base suitable for bathing babies or small children. 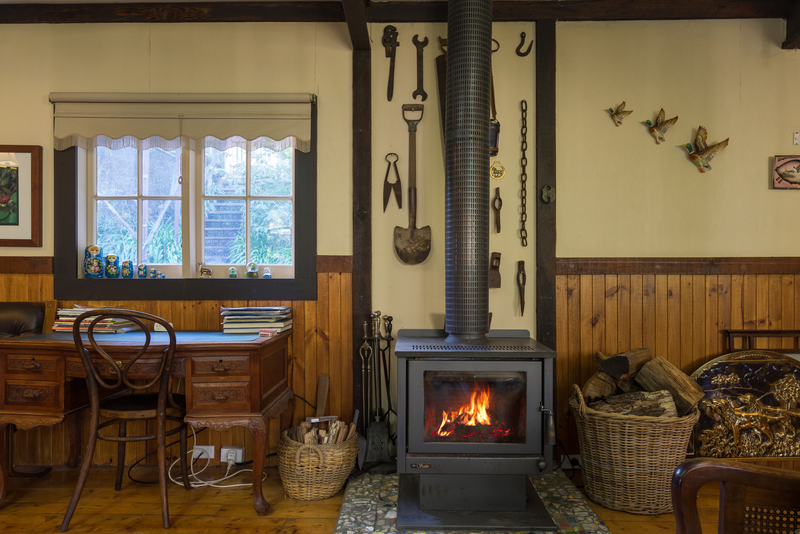 Of course, you can just sit back with a glass of wine and soak up the atmosphere while staring into the fire or enjoy the views across Stringers Gorge. 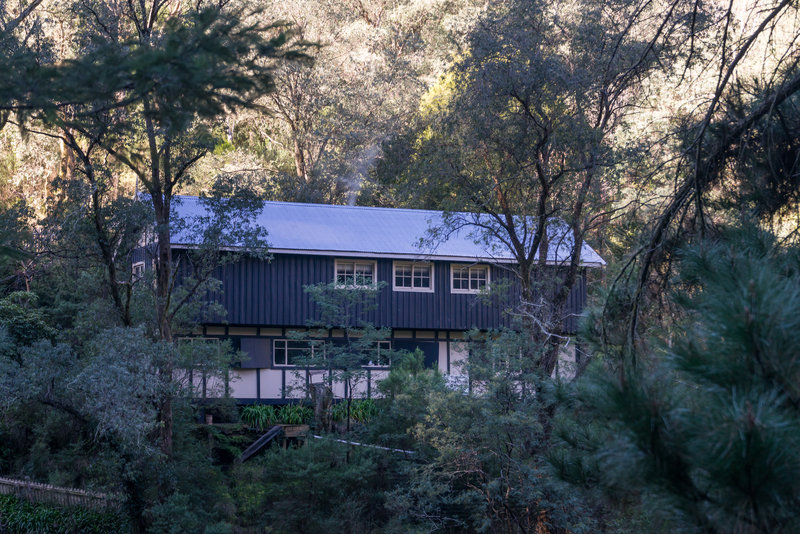 Stringers Creek flows through the valley directly below the house and the only noise to disturb the tranquility is that of the rushing creek, the calls of the black cockatoos, kookaburras and lyrebirds, or the whistle of the steam train as it passes by. The master bedroom is huge and opens off the lounge room. 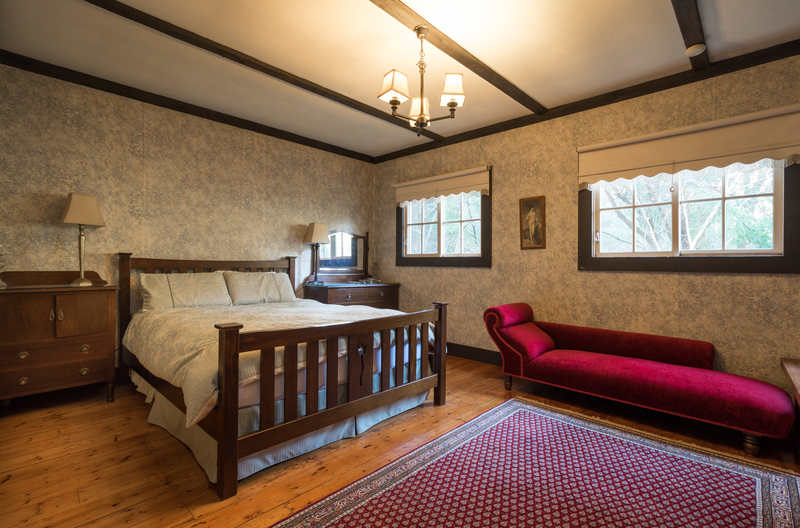 It features a queen size bed, down doona, bedside lamps, chaise lounge and other antique furnishings, a Persian rug, and more stunning bushland views. 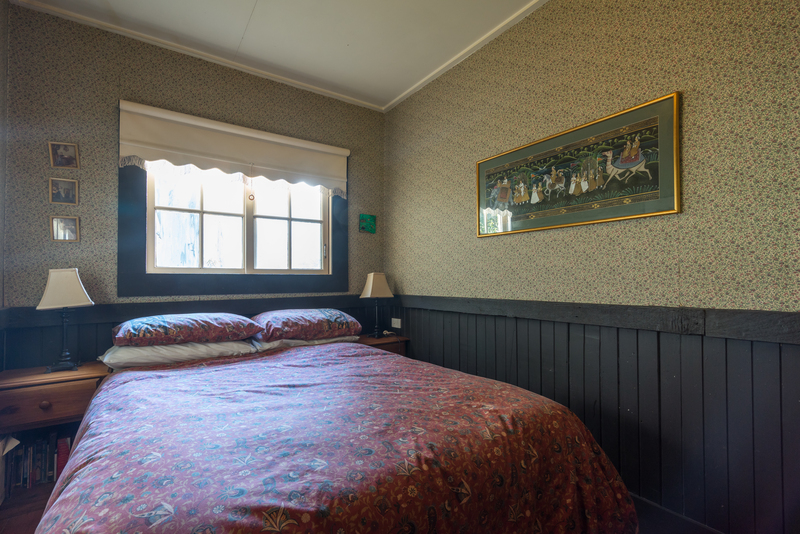 The 2nd bedroom also opening off the lounge room has a double bed with a cosy feather doona, bedside lamps and an antique dressing table. The 3rd bedroom also opens off the lounge and has a set of bunks with reading lights and wool doonas. There is a spare mattress under the bunk, or there is another set of bunks in the downstairs lounge. There is a cot with linen available for toddlers, (Meets Australian Safety Standards), and this fits comfortably in the master bedroom. (You will not fit a cot in the double bedroom). There is also an Ikea high chair, and a built in stair gate at the top of the stairs. 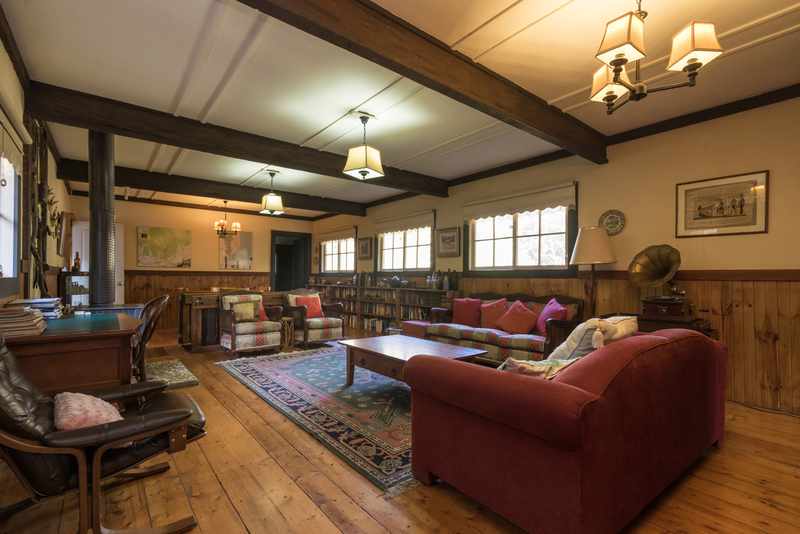 While the Coach House sleeps 8 comfortably, if you have a bigger group we can also accommodate an extra couple right next-door in Stringer’s Cottage. This is fully self contained with a queen bed and comes with all linen. (check link for more details). There is an outdoor dining table and chairs on a shady lawn with views across Stringer’s Creek. There is also a hammock and two Adirondack garden chairs to lounge in and take in the solitude. 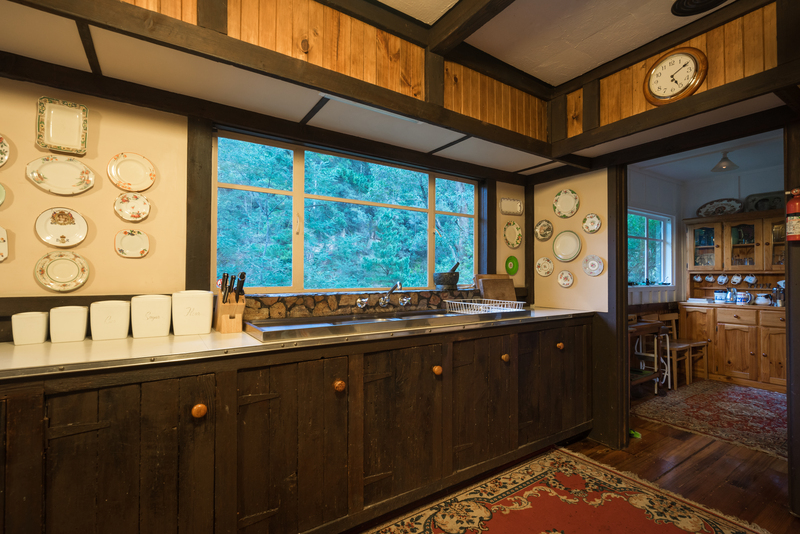 A 4-burner BBQ is located on the porch under cover and there is seating there for the smokers, and a darts board to while away the time. Please note, the property is not fenced.